This past weekend, I was speaking at a church and one of the staff members was talking about small groups. He made a great point that I want to pass along to you. And that's this. Dialogue is more effective than monologue when it comes to learning, understanding and communicating. From children to adults, people are more engaged when you use dialogue to help them discover the truth you are trying to communicate with them. Many of us grew up in a monologue format. We sat quietly (some of the time) while a teacher verbally taught the lesson. The problem with using a monologue format is this - it's not the way kids (and adults) learn best. In fact, studies show that it is the least effective way to learn. So why do we keep using a subpar learning method? I think one reason is because it takes more work to create a good dialogue experience. You have to get kids to open up and talk about the subject. This means knowing how to ask the right questions and facilitating a good flow of discussion. It's much easier to just plan for something you do by yourself while the kids watch and listen to it. But we should be more concerned with being effective than we are with things being easy. Another reason is teachers are afraid they will "lose control" of the class if they let kids talk. You have to get comfortable with a noisy classroom. But done correctly, a noisy classroom is what you want. When kids are engaged and learning, it is going to be noisy. We see ourselves as a teacher rather than a facilitator. There's a big difference between the two. A teacher gives out information. A facilitator guides kids to discover the truth in ways they learn best. We miss opportunities to get kids talking. Every activity should have discussion questions tied to it. Every game should be used to jump start conversation. Every lesson should have as much, if not more, questions to prompt discussion. Take a look at these stats. It measures the effectiveness of teaching methods. 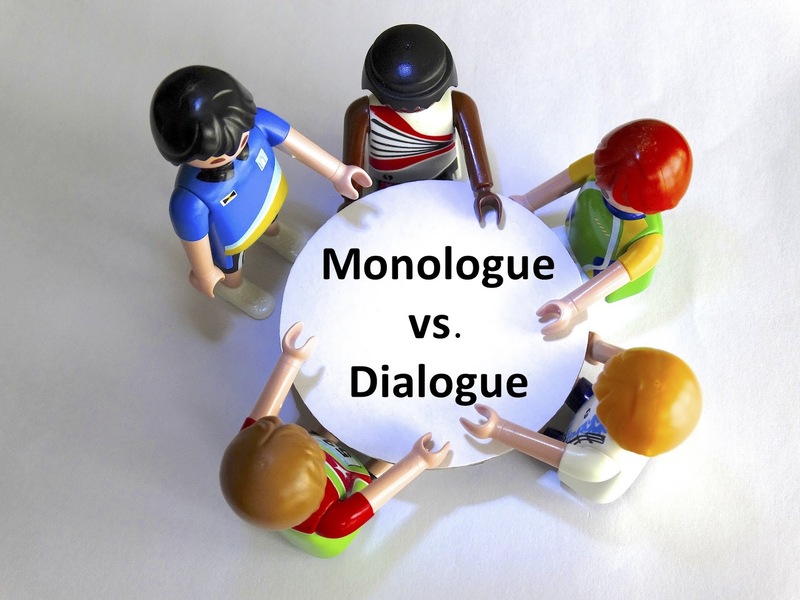 Measure the time you spend in class using monologue versus the time you spend using dialogue. Include open-ended questions throughout your lesson. Effective dialogue moves beyond yes and no answers. Tell the kids you want to them to talk during designated times. This shifts away from saying "ssshhhh" and "quiet please" to "let's talk more about what we read in that verse." Measure your success based on how much the kids talked versus how much you talked. Remember the voice of Charlie Brown's teacher and parents? It was like "wonk bwonk, codlue, bdgamaiclic, ygamatick, etc. (that was my attempt at writing confusing garble). When we sit kids down and become a talking head for the next 45 minutes, kids zone out and what they are hearing is something like Charlie Brown's teacher. One last thought. Want to increase the effectiveness of your lessons? Increase the amount of time you dedicate to dialogue and you'll see the results you're looking for. If you're looking for curriculum that gets kids talking throughout the lesson, then check out these series that we created. One year's worth of curriculum. Curriculum that is grounded in teaching kids 12 Biblical truths in 12 months. You'll see a big element we've included in the curriculum, is lots and lots of time for dialogue. You can get more information at this link and see lesson samples, videos, etc.